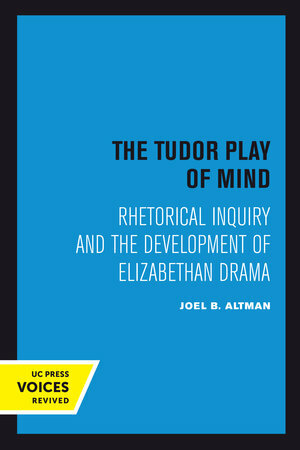 Contrary to the widespread assumption that Elizabethan drama grows out of an essentially homiletic tradition, The Tudor Play of Mind proposes that many important plays—including such diverse works as Gorboduc, Endimion, Tamburlaine, The Spanish Tragedy, Every Man in His Humour, and Bussy D’Ambois—are informed by the ancient rhetorical tradition of posing questions and arguing them in utramque partem emphasized in humanist education. This accounts for the complex and often ambivalent responses they demand. In support of this thesis, Joel B. Altman shows how abstract debate questions were developed into increasingly subtle mimetic fictions in the sixteenth century. He discusses the significance of this process for the drama through detailed analyses of early debate plays, the Terentian commentaries and English comedy, Lyly's court allegories, Senecan tragedy, and the experimental plays of Marlowe. Altman’s argument that Tudor playwrights offered their audiences dramatized inquiries will profoundly affect our interpretation of individual plays and our assessment of the larger cultural function of drama in the period. This title is part of UC Press's Voices Revived program, which commemorates University of California Press’s mission to seek out and cultivate the brightest minds and give them voice, reach, and impact. Drawing on a backlist dating to 1893, Voices Revived makes high-quality, peer-reviewed scholarship accessible once again using print-on-demand technology. This title was originally published in 1978. Joel B. Altman is Professor Emeritus of English at the University of California, Berkeley.